New arrivals queuing for tent allocation at Dadaab Refugee Camp's Ifo Extension site in July 2011. Forced to make a new round of cuts in food rations for refugees in Kenya, the World Food Programme (WFP) has appealed urgently for nearly $14 million to feed the 434,000 refugees living in Kenya's Dadaab and Kakuma camps and in the new Kalobeyei settlement. “We are appealing to donors to quickly come to the aid of the refugees, who rely on WFP food assistance for survival,” Annalisa Conte, WFP's Representative and Country Director for Kenya, said in a news release. WFP currently provides food relief to refugees in Kenya's Dadaab and Kakuma camps, as well as the newly established Kalobeyei settlement. This assistance comes as cash transfers and food distributions. For those most vulnerable, the agency also offers specialized fortified foods to prevent malnutrition. Beginning this month, the UN agency was forced to reduce food ration by half for the refugees' monthly entitlement, which will only last until the end of February if no further funding received. 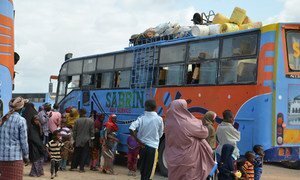 The Office of the United Nations High Commissions on Refugees (UNHCR) welcomed a statement today from the Government of Kenya in which it reiterated its continued search for solutions for refugees at the Dadaab camp, where it has been hosting and protecting refugees from Somalia for many years.